Gadgets and electronic items have a great influence in today’s world. It seems to invade a person’s life like a parasite. Seldom do you see a person sitting idle. Smart phones have replaced relationships. Look around you where ever you are now, you see majority of the people in their own world with smart phones, let it be airport, doctor's office or a small line at a takeout place, it’s hard to overcome those waiting minutes without touching and browsing through the smart phone at least once. These gadgets have changed the human nature drastically. The dearth of normal courtesy and manners is extending its limits. The bad cell phone etiquette of talking loud in public is the most petulant behavior. You might be wondering why I am bringing this up. Recently I encountered an incident where cell phone had took over someone's thinking and behavior to cause annoyance for others. It made me ponder the influence of gadgets in our day to day life. This happened few weeks ago when I went to a store with my kids after picking them from school after my work. Long 8 hrs in front of the computer really makes you feel some off time from screens and loud noises. I was dragging myself to the store to get my grocery done for the week. As soon as we entered the store, I noticed a well dressed lady. She was going through each and every aisle talking loud on her smart phone. It didn't take much for us to realize that she was following us each and every aisle by talking loud about her work. People around her were literally starring at her. I had no answer for my kids' inquiry why she was so loud and following us. I figured that she lost her focus what to shop for as she was so loud and intensely talking to the person on the other end of the phone and hence started to aimlessly follow us into each aisle with a cart. On the way she was knocking thing down on the aisle as she was juggling between the shopping basket, a heavy hand bag and a smart phone with her two hands. I had to make a quirk to the billing counter to put an end to the situation. Literally we had to abruptly cease the shopping and flee from that store...lol. I am sure you might have seen people like this around you. It is sad to see people behave like this in public causing nuisance to others. Weather is getting better here in the North East and we see the sun shining brighter day after another. Signs of spring are sprouting in my yard and I am glad to see the small nib of tulip greens trying to push the dirt hard and protrude out. The sunshine perked my mojo to make something apt to enjoy the warmth and make use of the bright light that was gazing my kitchen through my patio window. 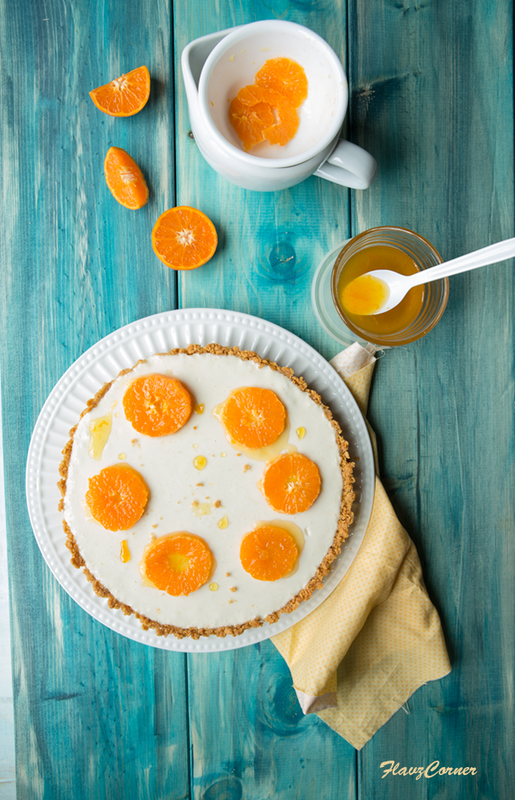 Here is a simple yogurt orange tart to welcome the spring. This recipe was adapted from better homes and gardens magazine. It’s a simple, quick and easy guilt free dessert. With this post I was able to use my tart pan I bought couple of years ago :). It took me so long to post my first tart recipe. I love my non-stick Wilton tart pan with removable bottom. They worked well even with coarsely crushed corn flakes crust in this recipe. 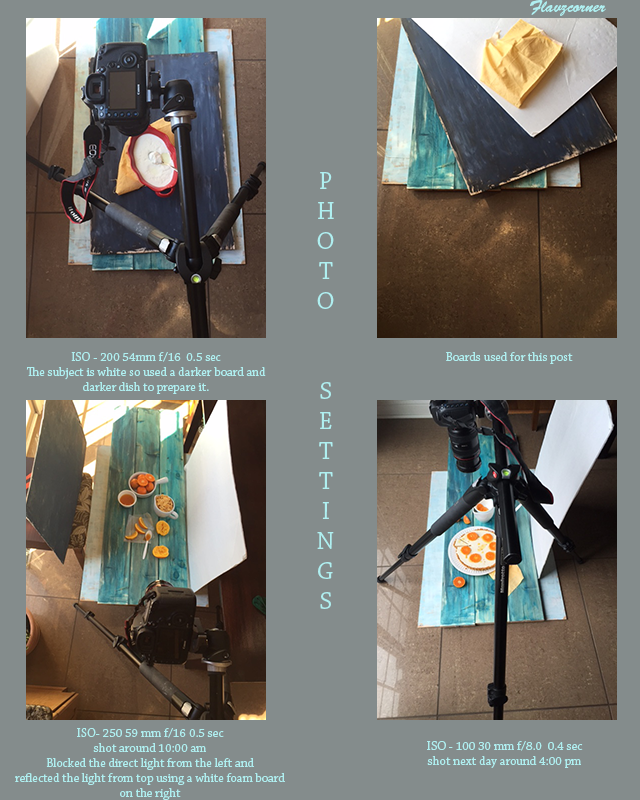 I had put together a collage to show the setup pictures. I used a 24-70 mm zoom lens to get various shots for this post. Prime lens are recommended for food shots. Combine the crushed corn flakes, melted butter and brown sugar in mixing bowl. Press the mix into the bottom and sides of the tart pan and bake for 8-10 minutes. Take it out allow it to cool. Bloom the gelatin powder in 1 tbsp of water in a bowl. 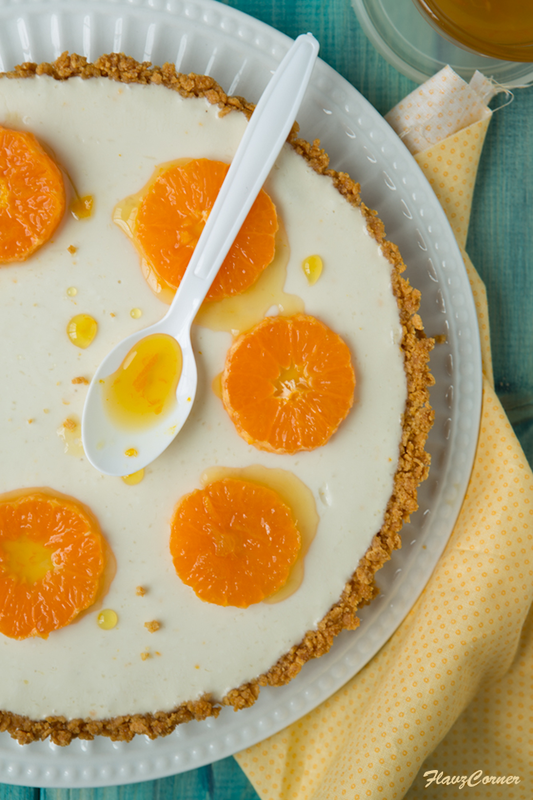 Mix the yogurt and orange zest together. 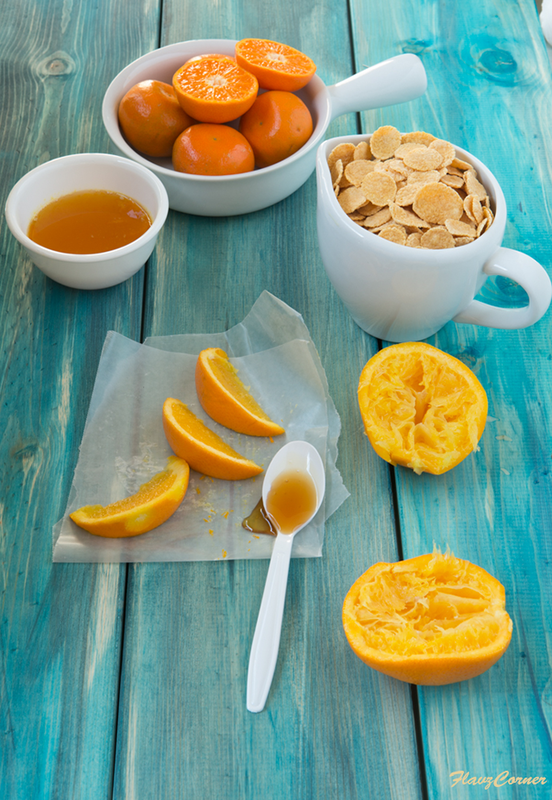 Warm up the honey in microwave for 30 seconds and mix with the bloomed gelatin and add to the yogurt mix. Combine well and pour over the prepared tart crust. Cover it and chill in the refrigerator for 4 hrs or overnight. If using store bought marmalade, warm it up in microwave for 20 seconds till melted. 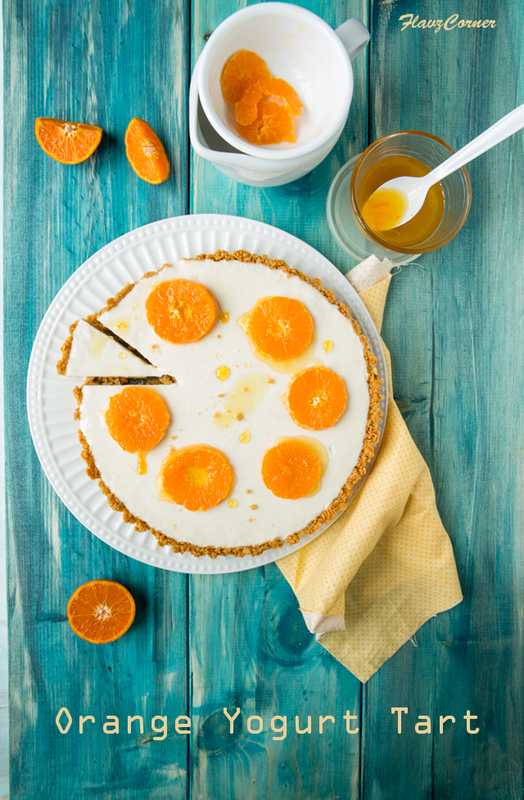 Peel and slice a clementine or tangerine or a naval orange into thin slices and arrange them on the yogurt tart. Pour the marmalade over the orange pieces. 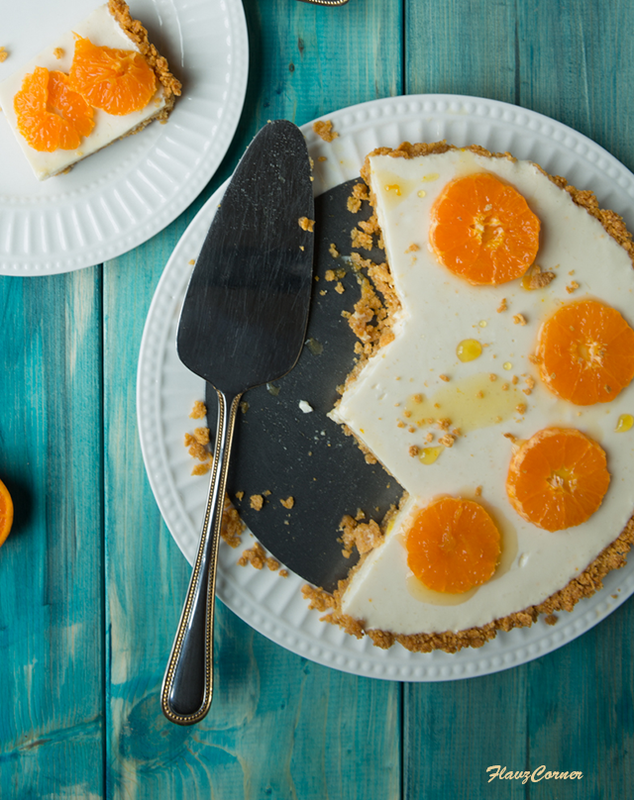 Slice them and enjoy the guilt free dessert. Yogurt - Take a heavy bottom steel sauce pan. Rinse the inside with cold water. Pour 4 cups of milk into the sauce pan. Set the stove flame to low ( settings 2) and the timer to 30 minutes. The milk will boil within 30 minutes on a regular stove. Turn off the flame and let the milk come to luke warm temperature. Remove the layer of fat that accumulates at the top like a skin. Pour the milk into a glass or ceramic dish. 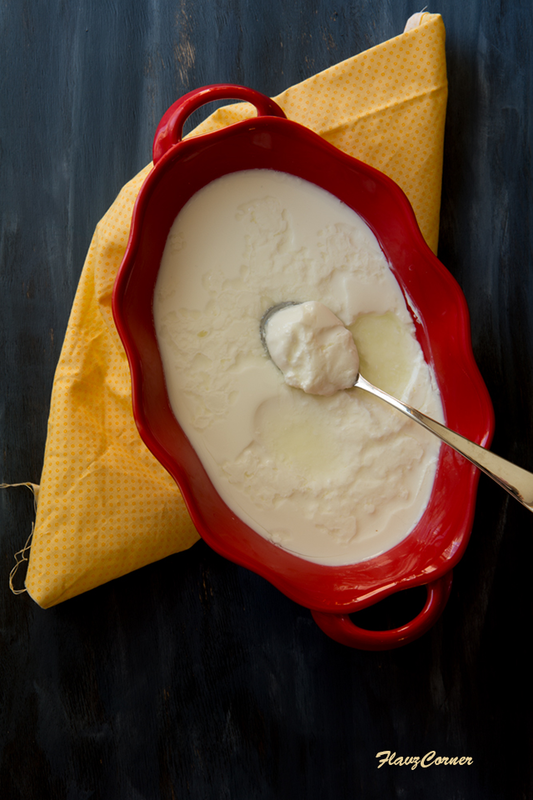 Add 4 tsp of plain yogurt (greek or regular that comes in a cup) into the milk. Warm the oven to 170 °F. Turn off and wait for 5 minutes. Place the prepare milk into the oven and cover it with a lid. Close the oven door and leave it in the dark for 4 to 8 hrs. Plain thick yogurt will be ready. If using 2% milk, you will see some amount of whey. You can drain the excess whey using a muslin cloth. The plain yogurt is ready to be used for anything. Make sure to use a clean dry spoon to transfer some freshly culture of yogurt into a clean glass container with a air tight lid to prepare another batch of yogurt if you like. Marmalade - Warm up 1/2 cup of freshly squeezed orange juice, 1 tsp of orange rind without the pith, 1/2 tsp of orange zest and 4 tbsp of sugar in a saucepan till everything is combined well. Cover and cool in the refrigerator for 1 hr. The marmalade or orange syrup is ready to be used as a topping for anything. That looks like sunshine on a platter :-)) So beautiful and delicious! People do get weird with their cell phones, don't they? Anyway, what a splendid looking tart! Love the colors, and I know the flavor must be outstanding. Lovely dish -- thanks.